Note to readers.. if you want more discussion on this topic we suggest you pick up a copy of the latest revision of Pozar's Microwave Engineering, look for it on our book page. Any media that can support a electromagnetic wave has a characteristic impedance associated with it. Although characteristic impedance units are in Ohms, it is not a "real" impedance you can measure using direct current equipment such as a DC Ohmmeter. And although transmission lines have real loss at microwave frequencies, this isn't what we're talking about either. Let's add one caveat to the above paragraph.... waveguide must be treated differently from this whole discussion of characteristic impedance, go here to learn about waveguide "wave impedance". Technically, waveguide isn't really a transmission line, even though we often treat it as one! Sounds simple enough, but unless you are dealing with "free space", there is no transmission line that is infinitely long. But that equation is starting to look like a version of Ohm's law, where R=V/I. The transmission line model now has its own page. Now let's look at the general equivalent circuit of an infinitesimally small piece of a transmission line. All circuits elements are normalized to length in transmission line models; in the metric system the units are Ohms/meter, Farads/meter, mhos/meter and Henries per meter, we will use the "prime" notation when we are discussing quantities that are normalized per unit length. This solution to the wave equation for transmission lines was developed by Oliver Heaviside a long time ago. We'll cover this later. You can look it up in Wikipedia for now! 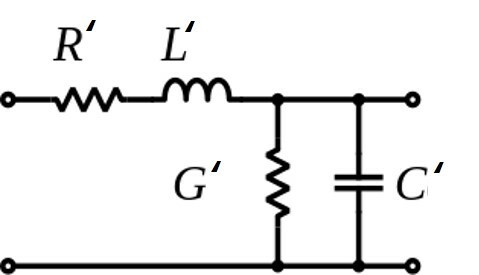 Characteristic impedance does not even need a transmission line, there is a characteristic impedance associated with wave propagation in any uniform medium. In this case we use the Greek letter eta for impedance. The intrinsic impedance is a measure of the ratio of the electric field to the magnetic field. Intrinsic impedance is calculated the same way as any transmission line. Assuming there are no "real" conductances or resistance in the medium, the equation is reduced to the simpler SQRT(L'/C') form. 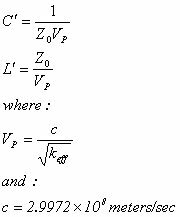 In this case the inductance per unit length reduces to the permeability of of the medium, and the capacitance per unit length reduces to the permittivity of medium. Note that the approximation that 0 is related to . There is no physical reason for this, it just happens that 1/36 gives better than 99.9% accuracy! Here's where the approximation involving 1/36 for permeability is what gives us that 120 value for free-space impedance (accurate to 99.9%!). Note that permeability and permittivity of the atmosphere on earth behave very close to free space (if it ain't raining! ), so we use 377 ohms for the characteristic impedance of free space in most calculations involving atmospheric propagation. Please feel free to forward comments or questions on this page, we want you to understand it!